In a few months, NASA scientists and the press will note the passing of the 30th anniversary since the launches of Voyagers I and II. 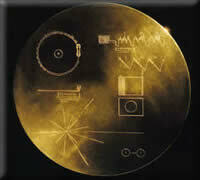 By now, both interstellar probes have passed beyond Pluto's orbit and are speeding out toward neighboring star systems, carrying with them copies of the Golden Record, a phonograph record full of images, music and recordings of life on Earth intended for any extraterrestrials who might happen upon the probe and wonder who sent it. 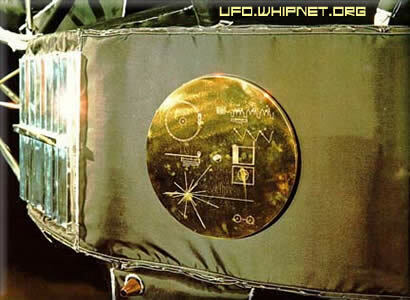 It's the same idea behind the plaque that was bolted onto the Pioneer 10 and 11 spacecraft, both of which are currently gliding out of the solar system behind the Voyager probes. While many Americans have heard of the record, most probably don't remember just what was on it. Fortunately, you can find the amazing images, which were chosen over the course of six months by a committee headed by Carl Sagan, compiled here. Today it's unlikely that we would choose to include this gee-whiz shot of the U.N. headquarters; or this greenhouse gas nightmare in India to portray ourselves. Not that we'd do so much better now than we did then; the aliens would probably be just as confused by a photo of President Bush, or an image of a kid using a laptop, or a YouTube video of Dancing with the Stars. It was the late '70s when these pictures were chosen, and Carl Sagan was probably smoking a lot of grass, but that doesn't quite explain some of the stranger images. What is this picture, exactly, and who let Archie Bunker in? "Of the 200 million stars in the Milky Way galaxy, some—perhaps many—may have inhabited planets and space-faring civilizations. If one such civilization intercepts Voyager and can understand these recorded contents, here is our message: This is a present from a small, distant world, a token of our sounds, our science, our images, our music, our thoughts and our feelings. We are attempting to survive our time so we may live into yours. We hope someday, having solved the problems we face, to join a community of galactic civilizations. This record represents our hope and our determination and our goodwill in a vast and awesome universe." For better or worse, we don't really do things like this anymore. New Horizons, the last spacecraft NASA launched that will eventually pass beyond the edge of the solar system, carries the ashes of the man who discovered Pluto, along with a piece of another spacecraft, an American flag and, for some reason (probably because people paid for the privilege), the names of more than 430,000 people stored on a CD. Apparently we've replaced attempts at interstellar communication with marketing stunts that will seem far kitschier in 30 years than Sagan's Golden Record does today.